... cast a spell on flower lovers. As long as I can remember, I remember my mother loving peonies. And, her mother loving peonies. Hydrangeas and peonies. 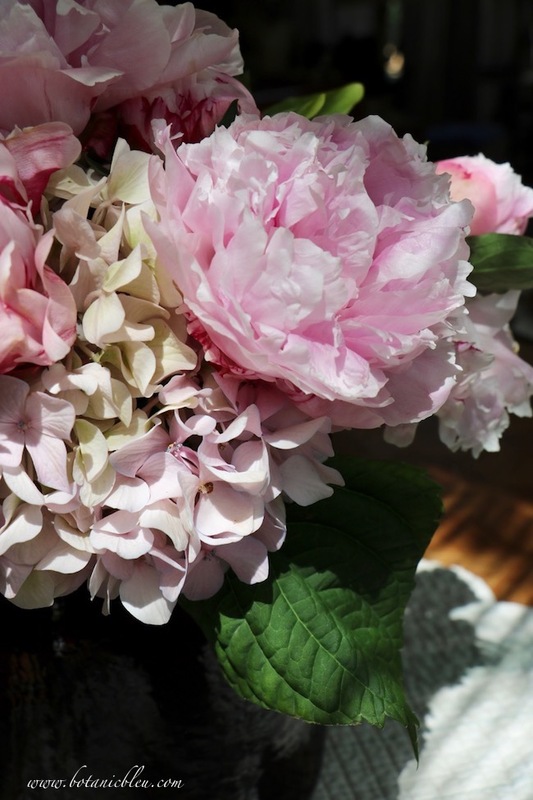 Now, my sister and I, are under the spell of peonies and hydrangeas and love them. And, my aunts, cousins, and distant relatives twice-removed(?) loved peonies. All were under the spell of tissue petals that hang heavily, touching the grass, after a rain. Actual relationships are now murky after so many years. So many are no longer alive. How was I related to those women? Are they relatives on Mother's side of the family or Daddy's side? I see their faces, can recall their names after pondering a moment, hear snatches of past conversations, but how were we related? Regardless, they all loved peonies. My family has been under the peony spell for generations. When you are looking for specific pieces of new furniture, say French Country dining chairs, what is your overall approach? Could it be, you and I approach furniture buying similarly? Here are things I do in general when looking for furniture, and what, specifically, I looked for in new French Country dining chairs. Summer solstice arrived with its greatest number of sunlight hours per day. Summer . . . we looked forward to you, anticipated your arrival with great happiness. A season of joy cultivated in childhood as school dismissed for summer vacation each year. Looking forward to summer is so ingrained in us, we continue to feel the joy each summer even though we do not have a long summer break from our jobs. Time seems to move more slowly in summer at our house. Is it a mind trick caused by more hours of daylight? 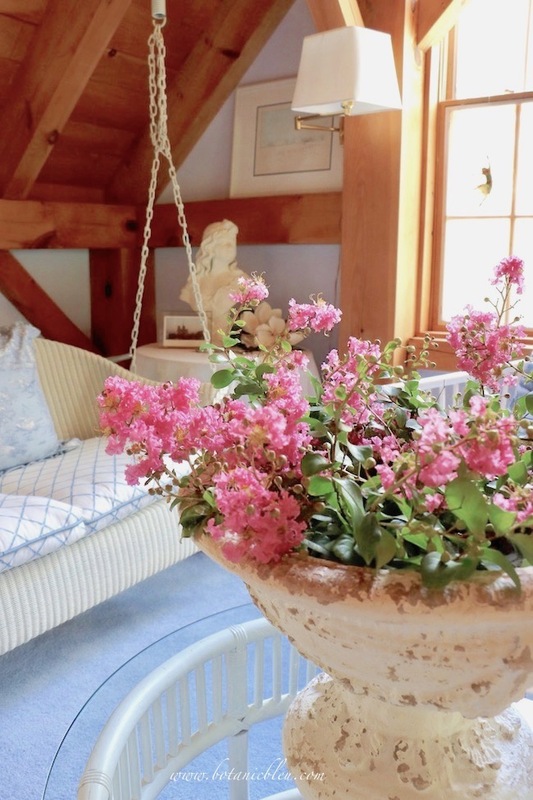 Welcome to the swing loft all decked out for summer with French Country decor. Almost everything new to the swing loft was in other rooms in my house, except for the new French Country white garden urn. And a new little lampshade. 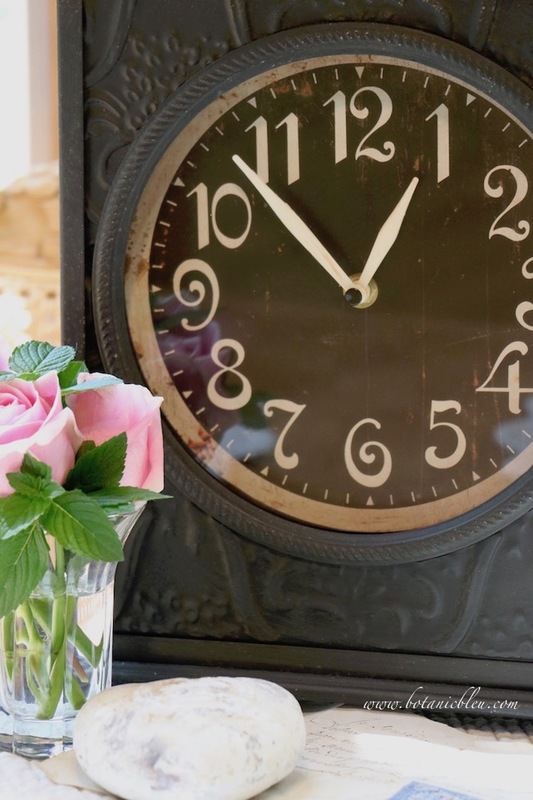 This spring has been a very good season for finding new French Country items to mix with my existing decor. This year has been a very good year for finding French garden urns. Not only did I find a collection of French-style garden urns from a local nursery, I also found a beautiful French Country white urn from a wholesale supplier in late March. The urns were shipped in May, and everything looks beautiful in them. 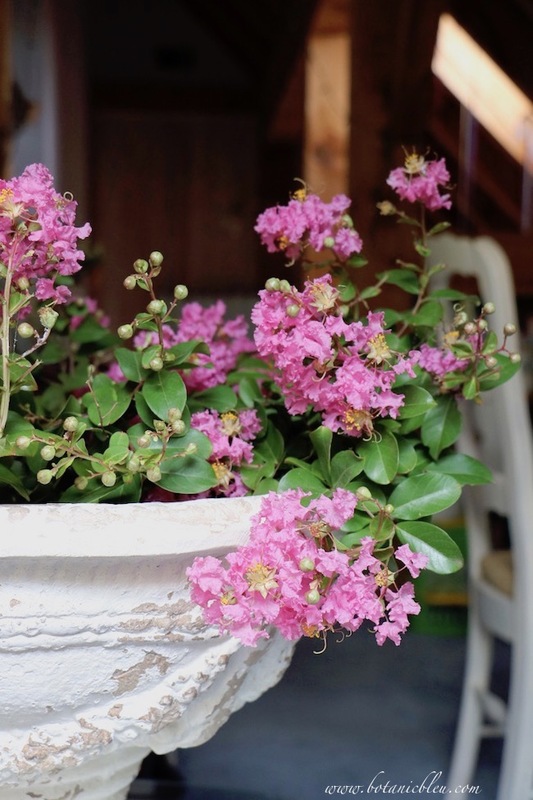 To add a French Country flower arrangement to the swing loft in my house, I filled one of the French-style pedestal urns with crepe myrtle blooms from my back yard. Adding French Country to a bathroom can be as easy as adding accents. Ready for ideas about which accents/accessories will give your bathroom French style? It is easier than you may realize. 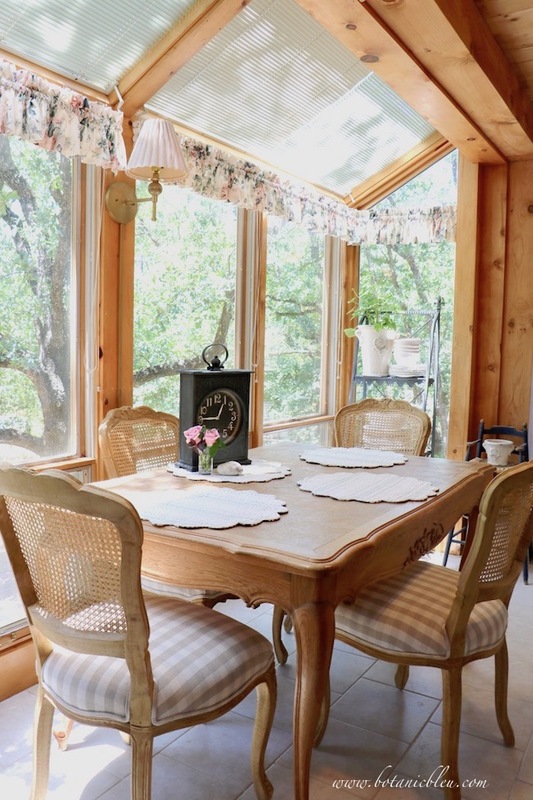 Begin with one piece of French Country furniture to add instant French decor. 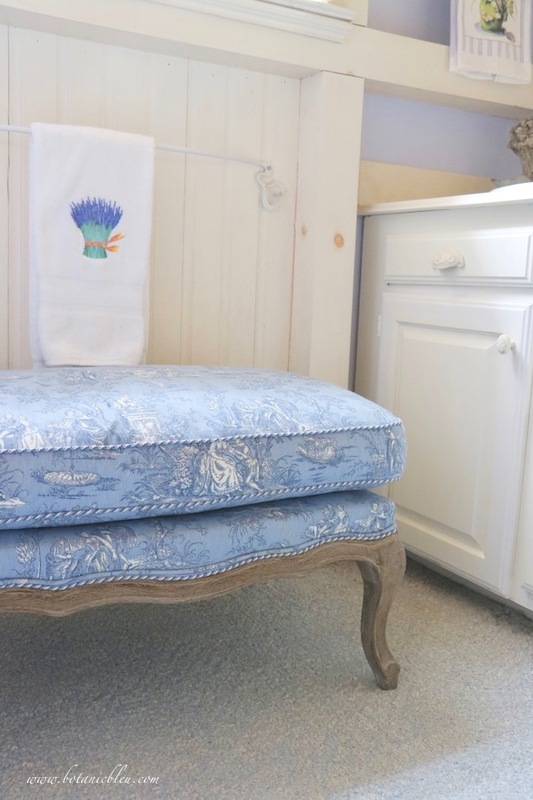 A small chair or an ottoman gives you a place to sit near a bathroom's vanity, and either a chair or bench is an easy way to add French Country charm to any space. For small spaces like bathrooms, one small chair or bench makes a big impact in setting the room's style. Creativity is within all of us. And there is more than one kind of creativity. Defining creativity is even an exercise in creativity itself since there is more than one aspect to the definition. Some people may seem naturally creative, but chances are their creativity was inspired and nurtured over the years and flourished as a result. 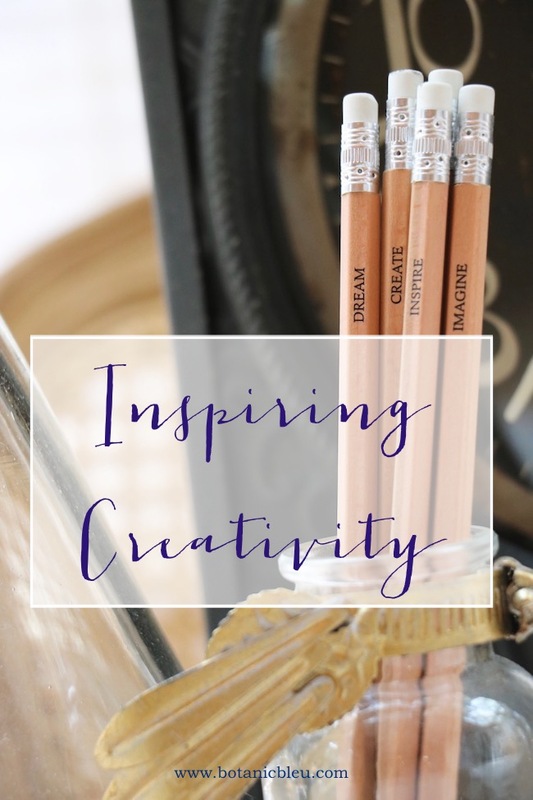 Where and how is creativity inspired and nurtured? One way is by being around people who share their creativity and who explain their creative process. Thus begins a new series. When you live in an area with hot, hot summers you can still enjoy sitting in a swing sipping iced tea. 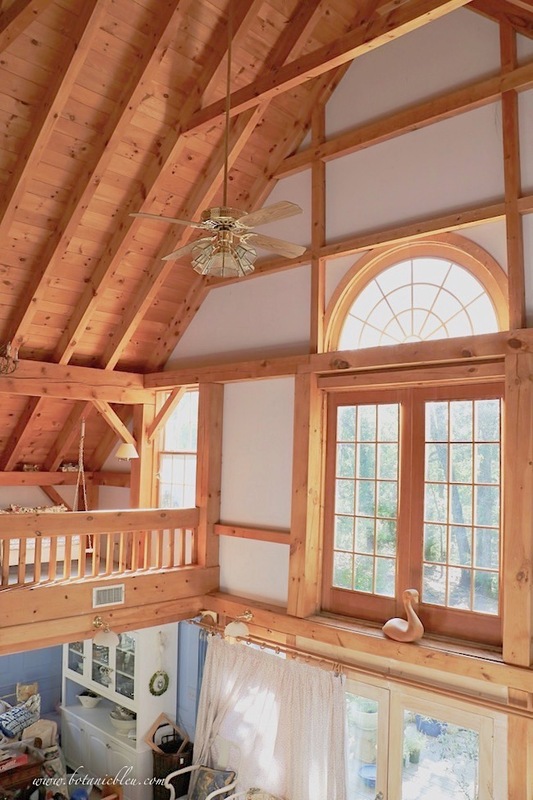 Just create a space indoors to set up as an indoor porch ... like our loft that looks out large windows to treetops.